An umbrella that has been used for a long time transformed into a Yo-kai. It cheerfully hops about on a single leg while reminiscing its owner's smiling face. Yo-kai Medallium Bio: An umbrella that has been used for a long time transformed into a Yo-kai. It cheerfully hops about on a single leg while reminiscing its owner's smiling face. 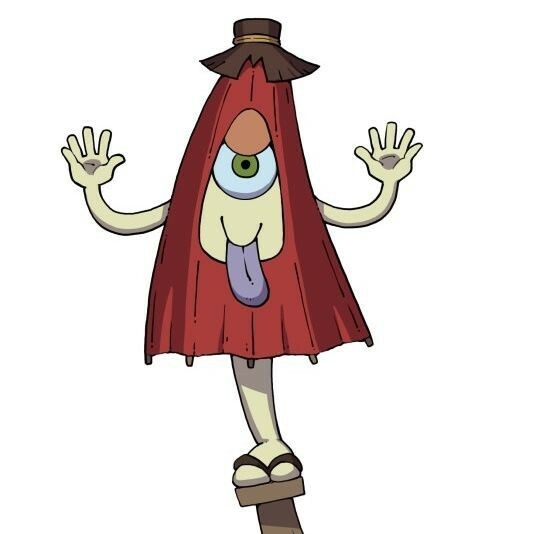 Karakasa-obake appears as a red oiled paper umbrella with a brown tip, with a narrow white face, two white arms and a single eye, its purple tongue lolling out. It wears a one-toothed geta on its one leg. Karakasa-obake is based on the youkai of the same name, born from a discarded oiled paper umbrella. It's easily the most famous type of tsukumogami, youkai born from tools and items that have survived for 99 years (other examples are the bakezōri and the ungaikyō). With a single eye and its tongue always lolling out playfully, the karakasa-obake hops around on the single leg that used to be its handle, wandering through the night and having fun with its tsukumogami friends. Like many of its kind, it's a harmless and even cute creature that is content with playing innocent pranks and enjoying its life as a youkai.